I have a question this mod is compatible with the DarNified UI NV? You might want to consider using Vanilla UI Plus* instead of this. * not on the Nexus...google for it. This mod doesn't seem to work with Project Nevada for me. Anything I can do to fix it? Doesn't work and clashes with MCM. Not recommended. Yup, it's pretty outdated - I'd recommend Vanilla UI Plus. 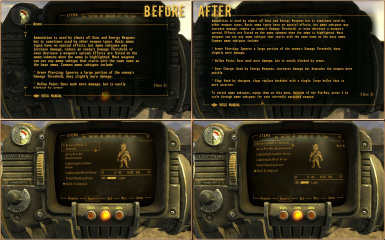 The only Pipboy HUD mod which I was able to easily install with NMM and which did what it is supposed to do without any problem. What problems did you have with VUI+ ? Darnified needs to be installed with Mod Organizer or it leaves out a certain step. 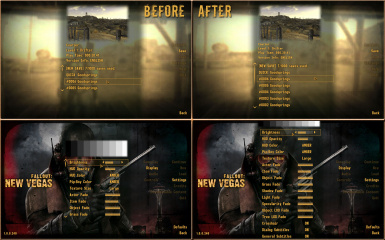 You should be using Fallout Mod Manager. Takes an extra step, but has zero issues. No longer recommend this mod, it's very old and outdated. Has a lot of issues with mods such as Loot Menu, Weapon Mod Menu, etc. Doesn't fully capture words longer than 13 characters without cutting them out of the pipboy. In response to post #57328131. 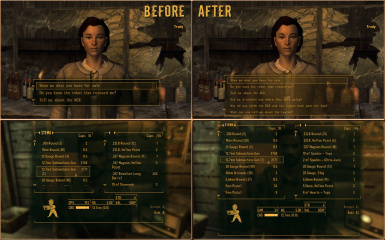 Keldjin wrote: The only Pipboy HUD mod which I was able to easily install with NMM and which did what it is supposed to do without any problem. If I remember correctly, even I my default Pip-Boy setting is Amber display color, VUI+ tried to blind me with very bright white characters. Does any of the 30 screenshots exhibited at the VUI+ homepage have this problem ? Don't install with One Hud or MCM as it causes a clash about which version of the Microsoft Visual C++ library it's using and says to upgrade to 2010 version, which is strange as this is the version I am running. Found this doing a clean install and test running a clean install save game, after each added mod. I will never EVER forgive you for not removing/updating or even notifying (DO NOT INSTALL) on the page. I WILL NEVER FORGIVE YOU FOR BREAKING MY GAME! There are detailed instructions in the readme for uninstalling this...having followed those instructions before, I can say that they accurately describe how to do the thing. Once you're over your little hissy-fit here, you might want to give 'em a try. I've tried everthing the read-me has given us. Done everything in order, but nope still broken. And I've wrote this comment after trying to fix my game. Anyone with half a brain test all mods before starting a playthrough. The solution to your problem can be found if you spend more time looking for it and less making "I won't forgive you" anime speeches. You are also more than welcome to request a refund in full for the cost of this mod. Someone can help me installing this with MCM? Yes - I would definitely recommend Vanilla UI Plus over this. This mod is old, unsupported, and seems to give lots of people trouble when they try to uninstall it. Vanilla UI Plus addresses way more issues and does it in a cleaner way. I personally never had issues. Installed with FoMM and no other UI mods interfering. Gotta say It still works fine despite it's age, I don't think I've ever had a problem with it. Hey, thanks for the feedback, I'm in the same boat. I'm checking out which mods to install for a first time pc playthrough. Funny thing, i've also been playing fallout 4 for the last year or so, installing a lot of the same mods because i also see you commenting on the settlement mod pages! I'm gonna jump on the Vanilla UI Plus bandwagon now - it does many things that MTUI does, and besides that makes a great many improvements to other parts of the UI, most of which I've not seen fixed by other UI mods.